Over the last century, abstract art has gone from the radical periphery to the mainstream center. But its accommodation into our visual landscape hasn’t necessarily meant a greater understanding of its forms or a greater acceptance of its language. After all, would it be too much to say we now live in an age—seemingly more than ever—when form must follow function? When abstraction must follow concreteness? Or the visual must follow the literal? Perhaps these observations are themselves unacceptable abstractions. But it does seem that the shape of things is more and more only permitted to be a product of their descriptions. Where abstraction presents formal questions, we expect literal answers. The present moment leaves little time for the contemplative demands of the pure forms of abstract art. So we have come to rely on established institutions, serving as the self-appointed guardians of abstraction, to place literal frames around abstract forms, to put abstract art in the safe context of history, of its artists and materials—and to tell us, often through extensive wall labels, what it all means. But such a reliance on the function of abstract art naturally weakens the power of its forms. Even though we are surrounded by the raw language of shape, we nevertheless arrive as foreigners to form’s native vocabulary. Over many years, the experience of encountering contemporary abstract art in the studios and galleries, outside of the functional mandates of the museums, has helped me understand form as a living language. Foremost among these artists has been the abstract painter Thornton Willis, whose art looks to form’s most basic elements to explore its most basic energies. “We are the primitives of a new culture,” said the Futurist Umberto Boccioni in 1911. By stripping down his compositions, Willis has taken a primitivist approach to the tensions of color, the compression of gesture and edge, and the dynamics of figure and ground to make manifest the power of form. Willis is just one member of the American Abstract Artists (AAA), a remarkable organization dedicated to promoting the understanding and acceptance of this language of form. The mandate of this artist association, now celebrating its eightieth year, continues to be as relevant as it was at the time of its founding in New York in 1936, when the nativist art movement known as the American Scene dominated the artistic landscape. At that time, the then-new Museum of Modern Art showed little interest in American abstraction, and politics, from the WPA to the Communist Party, made strict functional demands on artistic forms. The exhibition draws on the unusual architecture of the space—the lobby of Skidmore, Owings & Merrill’s 1961 Equitable Life Assurance Building, the International Style skyscraper that for many years housed the Paine Webber Art Gallery and, more recently, the gallery of UBS. Rather than a continuous wall, the gallery presents a series of panels arranged like dominos around the building core. With work hanging in a loose, salon-style arrangement, Wilkin uses each of these wall units to organize the sixty-five member artists on view. Free from the literal explanations that intrude upon today’s museum exhibitions, the open, mostly wordless assembly becomes a tutorial on form, encouraging the viewer to find affinities among the abstract art on view. One unit built around Thornton Willis’s The Congregation (2012), a composition of colorful, Tetris-like forms floating over an orange field, becomes a conversation on the blocking of space and the tensions of figure, ground, and depth of field, especially when it is positioned next to the deeply bending forms of Lorenza Sannai’s Il sogno di Artemide (2015) and Exactly, exactly now (2015) and the halo-like loft of Lucio Pozzi’s A Fact(2015) and Fugue (2015). Freed of literal meaning, abstraction gives visual license to keep looking. “Stripped of these superimposed tasks” of narrative, noted Ibram Lassaw, a founding artist of AAA, in 1938, “the underlying structure of art becomes clear. Colors and forms alone have a greater power to move man emotionally and psychologically.” Connections emerge the more you look, but the discoveries remain open-ended, encouraging further close viewing. At “The Onward of Art,” a wall panel with Manfred Mohr, Katinka Mann, and Sharon Brant (whose work is aptly subtitled “from An Uncertain Geometry”) is tied together through a shared interest in line—which in turn binds it to the pleats of David Mackenzie, the scratches of Jane Logemann, and the creased stamps of Stephen Maine on the opposite wall. On another wall, lines dissolve in Gilbert Hsiao’s dazzling triangleGTO (2015), a shaped canvas that connects to John Obuck’s square casements in Window (2015) and rounded bricks in Dome (2015) and Stephen Westfall’s diamond tiles in Otherwise (2013). Other arrangements similarly find affinities in the stripes of Kim Uchiyama, David Row, Li Trincere, Steven Alexander, James Juszczyk, and Mary Schiliro; the monochromes and hidden metallics of Gabriele Evertz, Marvin Brown, and Mark Dagley; the sweeping gestures of Mark Williams, Vera Vasek, Phillis Ideal, and Iona Kleinhaut; the triangles of Joanne Mattera and Roger Jorgensen; the diaphanous textures of Dorothea Rockburne, Emily Berger, and Claire Seidl; the spreading stains and hard edges of Don Voisine, Judith Murray, Nancy Manter, and Alice Adams; and the cloud-like forms of Ce Roser, Naomi Boretz, and Anne Russinof. Wilkin is right that the challenges of abstraction have evolved over the last eighty years. Today, she writes, “abstraction is often assumed to be empty unless it is fully bolstered with irony or a complex conceptual justification.” Such a description might easily apply to “The Forever Now: Contemporary Painting in an Atemporal World,” MOMA’s failed attempt last year at a survey show of recent abstract art. For perspective, Wilkin has added a historical section to “The Onward of Art,” which is mostly presented in the secure display cases that line the western corridor of the lobby. Here are some of the AAA’s leading historical members, including Esphyr Slobodkina, Ad Reinhardt, Jack Tworkov, Charmion von Wiegand, and, on view for part of the run, Piet Mondrian. The connections between the current and historical work are undeniable. Reinhardt’s black-on-black squares become Voisine’s springy diagonals in Dimday (2015) and Jig (2015). It’s the amplitude of the work that has evolved. The historical abstractions here convey soft-spoken quietude. The current work enjoys no such luxury. Noise is today’s ultimate challenge. So contemporary abstraction has learned how to raise its voice, still without saying a word. 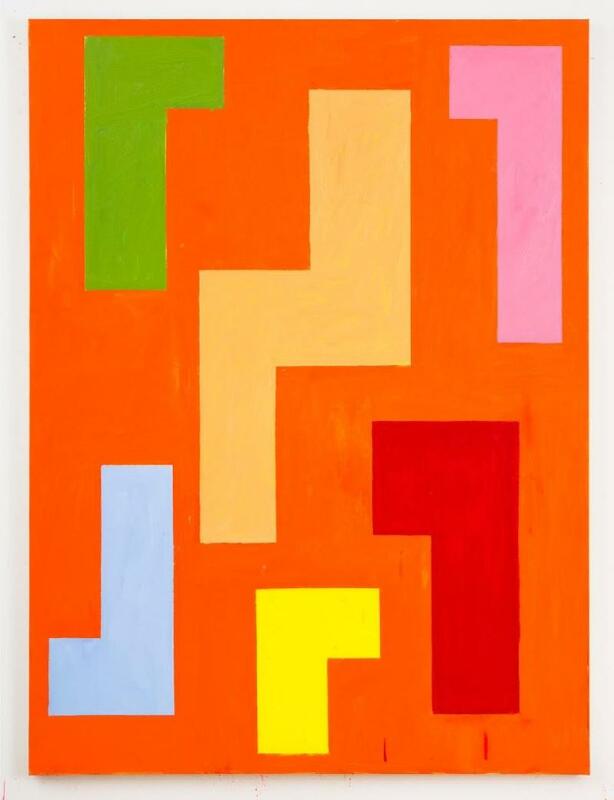 If the art of the outer boroughs is any indication, abstraction is enjoying a renaissance of late, with some of the most interesting recent work re-imagining and re-engaging with a century of abstract form. Often the best examples find ways to add impurities to abstract art’s pure nature, with new sensibilities bleeding into the edges. 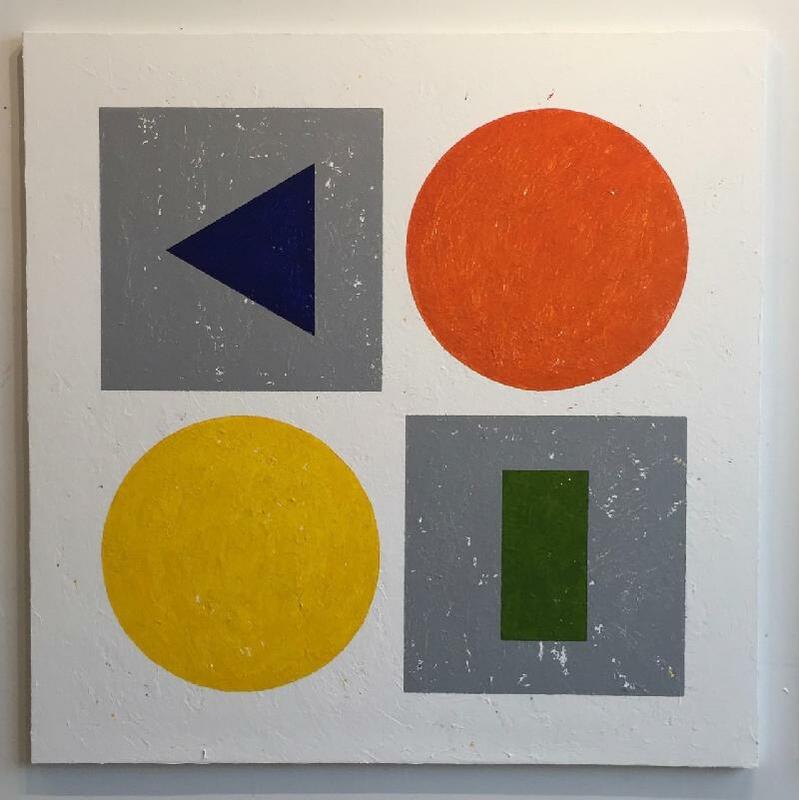 A new series of paintings, “Chromatic Alphabet,” represents an alphabet of colorful abstract shapes, while “Floor Translations” continues his storytelling around anthropomorphic paint splatters found on his studio floor. The Translations series, here collected into a catalogue of charcoal and ink drawings, with whimsical stories written out in schoolboy cursive, turns abstract stains into “The Bucktoothed Knifebeak and Althusser the Albatross.” The Alphabet paintings go the other way, transforming literature into a series of assured, hard-edged abstractions. Meanwhile just down the hall in the gallery building of 56 Bogart Street, Sharon Butler’s latest paintings were on view last month at Theodore:Art.3 The proprietor of the art blog Two Coats of Paint, Butler has been at the center of outer-borough abstraction and coined the term “The New Casualism” to describe a new abstract sensibility. At Theodore:Art, she took a formal turn with a series of small, lyrical paintings of tail lights and other forms drawn from her studio view overlooking the Manhattan Bridge—abstractions, again, imbued with a personal narrative. As an alternative to greater amplitude, the future of abstract art may be found in such a turn to sentiment that nevertheless manages to avoid sentimentality. 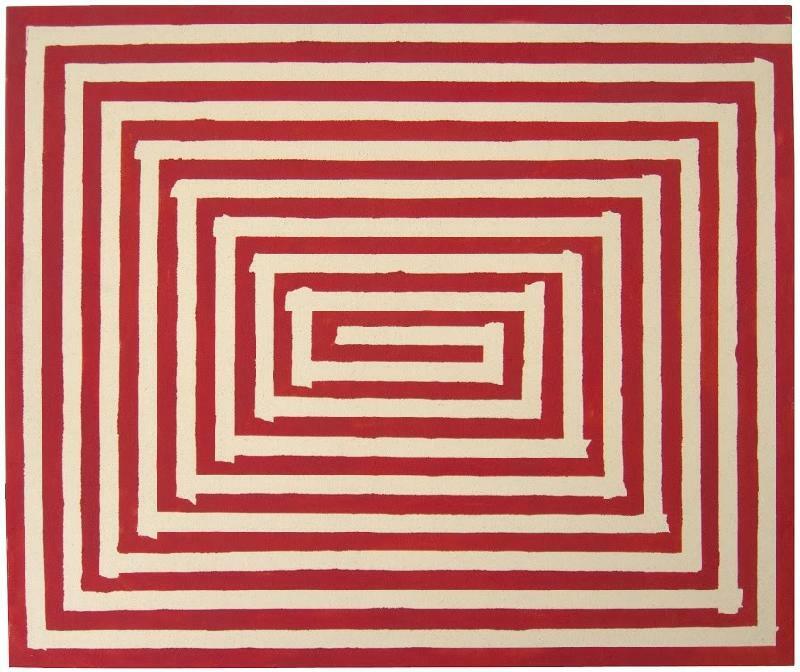 1 “The Onward of Art: American Abstract Artists 80th Anniversary Exhibition” opened at the 1285 Avenue of the Americas Art Gallery, New York, on January 18 and remains on view through March 25, 2016. 2 “Paul D’Agostino: Scriptive Formalities” opened at Life on Mars Gallery, Brooklyn, on February 5 and remains on view through March 6, 2016. 3 “Sharon Butler” was on view at Theodore:Art, Brooklyn, from January 8 through February 24, 2016.